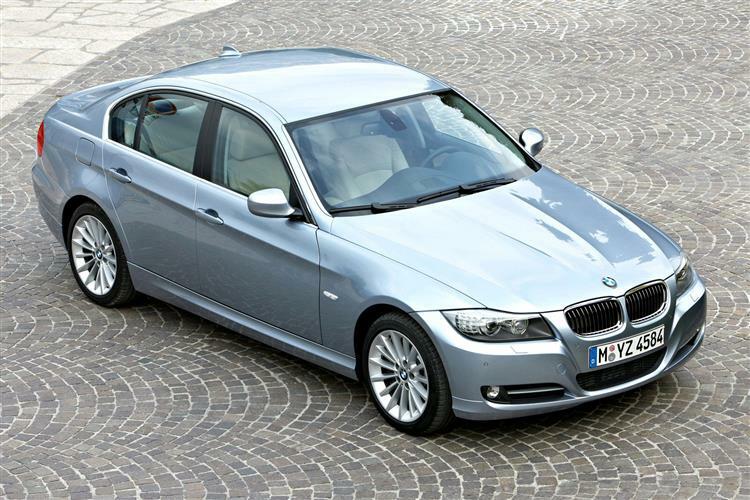 BMW got back to basics with the E90 generation 3 Series. This was the car that shucked off the gimmicky styling and did what BMWs have always done best - concentrated on the engineering and let form follow function. The results have been spectacularly effective and are a testament to sticking with what you're good at. Used examples are now appearing in decent numbers but they do hold their value well despite industry mutterings of oversupply harming the car's so-called exclusive image. Developing an all-new 3-Series was never going to be easy and the E90 generation, as BMW people dub this car, demonstrated clearly that the money men and the stylists had gone head to head in the battle between shifting big numbers and continuing the trend for challengingly-styled BMWs. The stylists blinked first. A good deal more conservatively penned than the rest of the BMW line up, this 3 Series consequently found almost universal acclaim. Although those wearing the black polo necks grumbled, it was a wise choice. With the 3-Series accounting for fully 52 per cent of BMW's UK sales, alienating this bedrock of customers with a wilfully odd-looking car was never going to make a sound business case. After all, this 3-Series was forced to redefine its place in BMW's range. For the first time in 29 years, it was no longer the entry level BMW model, and the range was developed in a way that 1-Series buyers could migrate to a Three on the way to bigger BMWs. At least that's what the suits in Munich were hoping. Bigger in every dimension to its predecessor, the 3-Series appeared in UK dealerships in April 2005 in saloon guise, the existing E46 generation coupes, Tourings and convertibles being sold alongside. 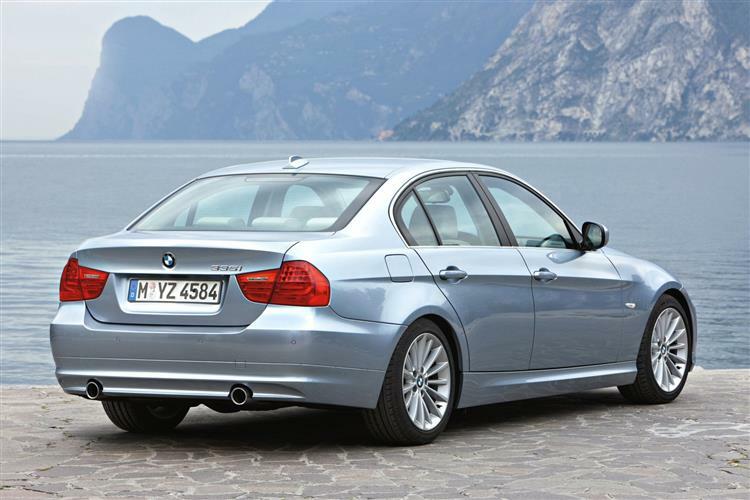 Touring models of this car appeared in September 2005 with the Coupes arriving in September 2006, but along the way, the 3 Series range has been fleshed out with the 330i (July 2005), the 330d (November 2005), the 318i (January 2006), the limited run 320Si (June 2006) and the 335i, 325d and 335d (September 2006). 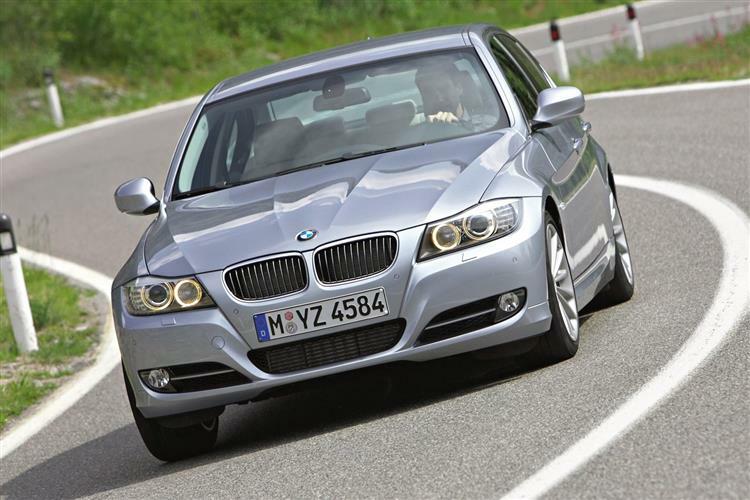 In the Autumn of 2007 BMW included its EfficientDynamics package across the 3-Series range with dramatic effects. The technology uses Brake Energy Regeneration and Auto Stop-Start amongst other features to dramatically cut emissions and enhance fuel economy. The headline grabbing model was the 318d which became capable of over 60mpg on the combined cycle and 123g/km emissions. 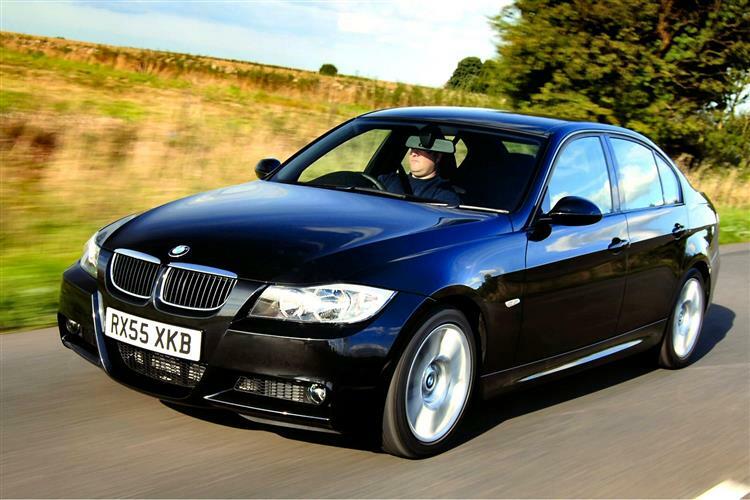 The V8-powered M3 saloon arrived early in 2008 and at the other extreme, September 2009 brought the super-economical 316d. Many of the contemporary BMW styling signatures are present, although they were toned down radically. The sill line is bowed, although nowhere near as radically as in, say, a 1-series. 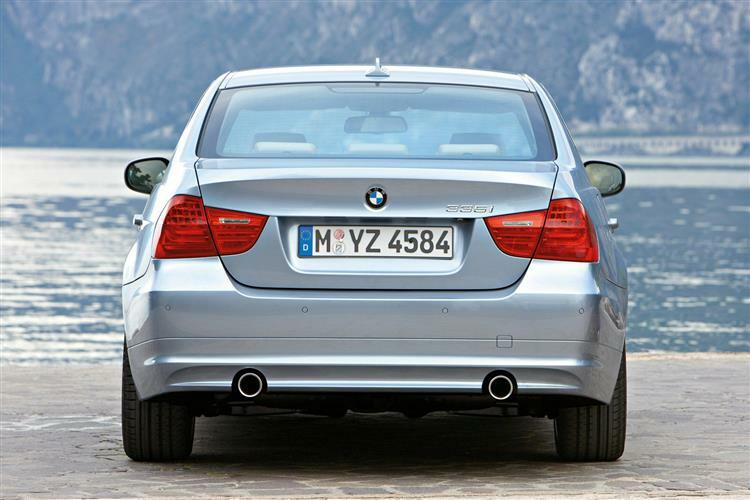 Compare how the rear bootlid is a chamfered and smoothed version of that worn by the 5-Series. Even the flanks betray a less aggressive concave contouring, while the rest of the traditional BMW cues such as the 'Hofmeister Kink' at the rear window and the kidney grille are present and correct. Although it's not what you'd call a striking piece of design, it is nevertheless mature and assured. The Touring model follows similar themes although the stylists had a freer brief when it came to the 3 Series Coupe. For a start, it's beautiful in its own right. Contemporary BMW design has been a strangely hit and miss affair but the bullseye was firmly hit in this instance. Taut, sleek, muscular and boasting not a single shared body panel with the 3 Series saloon, the latest Coupe earned whole legions of buyers before they ever clapped eyes on one in the metal. The silhouette is lower and more elongated, giving it an elegance that's singularly lacking in the buttoned-down saloon. The kidney grilles at the front were restyled to give a simpler, cleaner look while the headlamps have a more piercing stare. Move round to the rear and you'll pick out the broad tail light clusters that incorporate horizontal LED rods. On the way, you'll spot the sculpted flanks and should you tap the front wings, you'll find that instead of the high-pitched ring of steel, you'll hear the duller thud of plastic. In a bid to cleave weight from the 3 Series Coupe, BMW used plastic as well as the more traditional method of 'tailored blanks' - panels that are thick where structural rigidity is needed and thin where it's not. (approx based on a 2006 318i saloon) A clutch assembly is around £150. Front brake pads are around £60, a full exhaust about £420, an alternator around £150 and a tyre around £70. A starter motor is about £160. Eight engines are available. The entry-level units are the 318s with the i propping up the d. The 318i has the same 129bhp engine as the 118i and is capable of 0-60mph in 10s flat. Fuel economy of 38.7mph is not to be scoffed at but it looks a little thirsty next to the 318d's 50.4mpg. The 318d is slightly slower with 122bhp and a 10.6s 0-60mph time. The 320i is an engine based on the architecture of the 318i motor in the previous generation 3-Series. With improvements to the induction and VANOS systems, this engine jumps to a round 150bhp. Capable of covering the sprint to 60mph in 8.8 seconds and able to hit 137mph, the 320i can also manage to eke 38.2 miles from a gallon of unleaded. 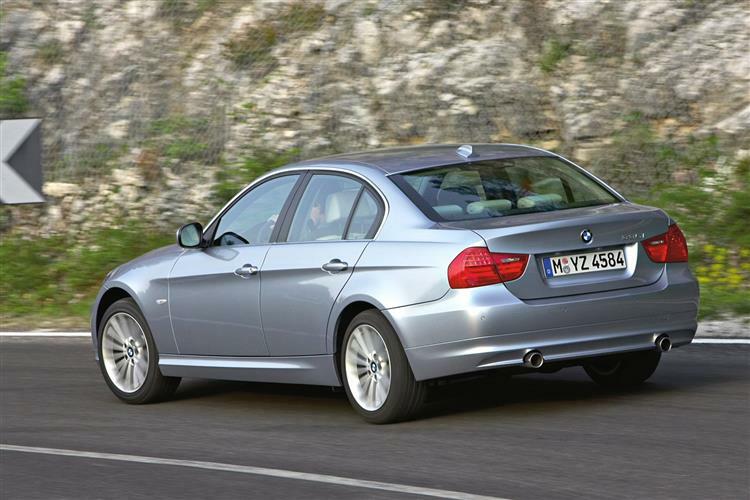 Also highly capable is the 320d, BMW's biggest seller in the old E46 generation car. In this instance, power leaps from 150 to 163bhp. This diesel will take a fraction over eight seconds to get to 60mph and posts a top speed of 140mph. The 49.6mpg fuel economy figure is a real standout. 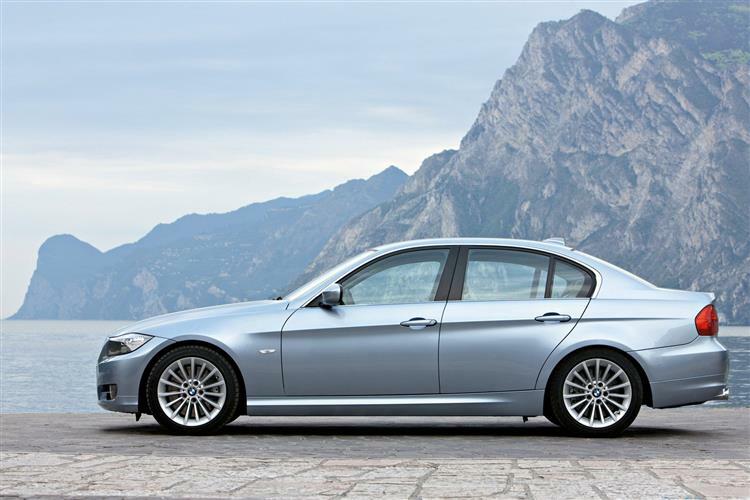 The 330i and 330d are two very successful aspirant models. The petrol features a 3.0-litre Valvetronic engine with technology that does away with conventional throttle butterflies in favour of a complex electrically-powered valve lifting system. Constructed from an aluminium and magnesium composite, this engine sits tucked well back in the car's cavernous engine bay and gives the car excellent weight distribution. Less weight also equates to better performance, more agile handling and lower fuel consumption and emissions. This engine punches well above its modest weight, knocking out 258bhp at 6,600rpm. On the road this translates into a surprising amount of heft. The sprint to 60mph from rest will disappear in just 6.3 seconds and will run into BMW's self-imposed electronic limiter at 155mph with plenty to spare. Despite this, the fuel economy figures are better than the old 231bhp 330i at 33.5mpg. The Valvetronic engine complies with the latest Euro IV emissions regulations and features an electric water pump to cool the engine block for increased efficiency. If you can't quite stretch to starting prices for this variant, a 325i petrol model is also available. Then there's the improved 330d, which is nearly as quick as the 330i with a 6.7s 0-60mph time and far more economical with 43.5mpg. A full 500Nm of torque makes this model an amazingly muscular choice. The 335i engine also merits special mention. Despite the 335i badge, the engine fitted up front in this car is 'only' a 3.0-litre, much akin to that found in the 330i. Whereas that car develops 272bhp, the 'blown' 335i is good for 302bhp. BMW could have no doubt turned the wick up on the turbochargers to offer way more power but the key to the 335i is in creating a turbocharged model that offers none of the drawbacks of turbo cars. In real terms, that means a sprint to 60mph in 5.2 seconds and a top speed limited to 155mph. That's not far off the old M3 and in terms of torque to weight, the 335i trounces the old hotrod, the M3 offering 171lb/ft per tonne compared to the turbo car's 184lb/ft per tonne. BMW obviously listened long and hard to customer feedback when designing this generation 3 Series. With more rear legroom, more standard equipment and better safety provision while retaining its position as the driver's choice in the compact executive sector, it hit all the requisite nails squarely on the head. There's no secret formula to the 3 Series selling in huge numbers, just solid commonsense. It makes a great new buy and a pretty decent used bet too as long as you're not expecting any screaming bargains.